When you see a word over and over again, its meaning starts to dilute. It becomes common and everyday, not exceptional or unique. Such is it with the word innovation, which appears in rosters of grant opportunities with increasing frequency. 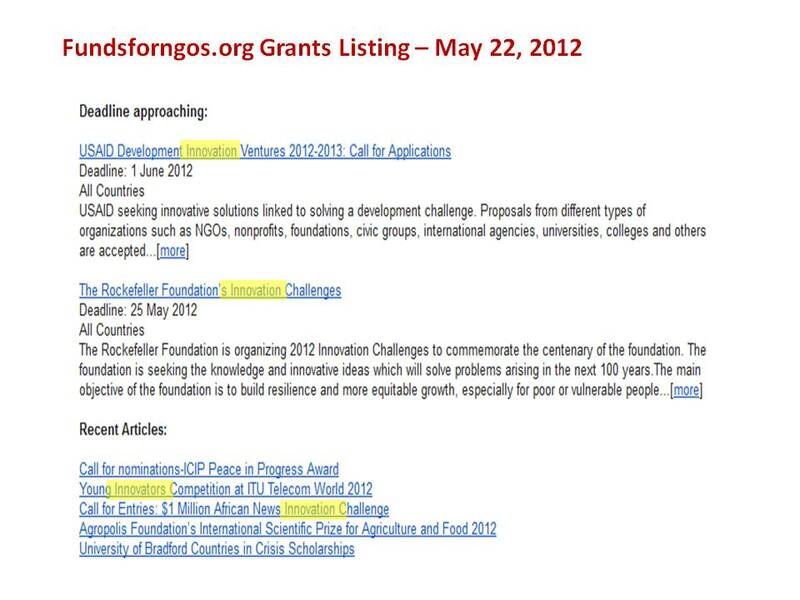 One day’s listing from the Funds for NGOs listserve included a call for applications from USAID’s “Innovation Ventures,” ITU Telecom World’s ” Innovation Competition,” and Rockefeller Foundation’s “Innovation Challenge.” This past week, the grant form of a major local funder asked me to report “the number of innovative activities offered.” That word again. Are the remaining activities therefore stagnant? I understand the desire that foundations have to inspire us to think about the problems of the world differently. In the fight against poverty, too many people remain at the edge of survival, and too many interventions have failed to make enough of a difference. I know that new technologies have fundamentally changed the well-being of many. I have sat amazed at some of the inventions I have seen produced by experts at large institutions like PATH and the Gates Foundation. So I get the attraction to the concept of innovation, but I wonder if the pendulum swing to innovate comes at a disadvantage to projects where innovation is not the solution to their most pressing problems. The poverty alleviation project I work with doesn’t need a new invention but rather old fashioned education and training, tried and true capacity building, and plain old respect for their basic rights to live lives of dignity. The second definition, “to make changes in something established,” is more interesting to think within our projects that defined in terms of social change. Social change by definition changes something established, namely society. This definition inspires us to think about an innovative outcome rather than an newly invented means to an end that may or may not change the world. I hope foundations continue to support the inventions that ease life for some of world’s most disadvantaged. I also hope that they keep in mind the effect of a slow drip of water on solid rock… the gradual impact that programs like work training, access to higher education, and community installed latrines have on what once seemed like impermeable challenges. Our innovation might involve subtle changes in leadership, program design, or concepts of community, and yet these subtle shifts may spawn new ways in which societies address their own most pressing concerns. The innovation may not be the solution. The solution may be rethinking innovation. This entry was posted in grantmakers/funders, philanthropy. Bookmark the permalink.